A couple of weeks ago, in the corridors of Stormont, the seat of devolved government in Northern Ireland, Bertie Ahern looked happy and relieved. After 10 years of negotiations and frustrations, a power-sharing government - something that had at times seemed a distant, unlikely prospect - had been achieved. 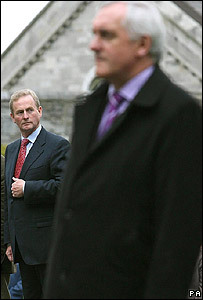 The man known across Ireland simply as "Bertie" told me that, as a politician, this was "as good as it gets". For Mr Ahern, the events of the last couple of days may push that achievement close for top billing. For much of the campaign, he was on the back foot, criticised and scrutinised, his strategy derided and his personal credibility called into question. The polls had, more than once, suggested that voters might dump him out of office. The two largest opposition parties, Fine Gael and Labour, with their "Alliance for Change", had suggested that the Irish electorate had an appetite for new faces and different policies. Many pundits joined in, asking if this might be the end of the road for the man who has led Ireland since 1997. Instead, he has won a remarkable victory, and is heading for a third term in office. His personal popularity, which has carried him through tough times before, has again paid off. The man once dubbed the "Teflon Taoiseach", because criticism just never seems to stick to him, has done it again. Mr Ahern may well be feeling pretty satisfied. So how did Mr Ahern confound the pollsters, the pundits and the bookies? Perhaps it was that personal popularity, or the fact that Irish voters objected to the questions and scrutiny of Mr Ahern's own financial dealings back in the 1990s - something those around him suggested had become a witch hunt. Or maybe it was a satisfaction with the status quo. Much of Ireland, though not all, has had it pretty good in recent years, enjoying rapid economic growth. The campaign focussed on the state of public services, especially the health system. But, as some looked down at their ballot papers, they might have wondered whether it really was the moment to sweep the current government from power. Mr Ahern, never one to blow his own trumpet, said Fianna Fail had done well because of a surge in support among young voters. He also complained about what he said was an increasingly intrusive media. Yet in the next couple of weeks Bertie Ahern will have little time for his favourite leisure pursuits, watching sport or tending his beloved hanging baskets. He might allow himself a celebratory pint of his favourite Bass ale in his north Dublin local, but the pressing task of deciding the shape of his future government lies ahead. Thursday's election saw Mr Ahern's Fianna Fail emerge as the largest party, while the biggest opposition grouping, Fine Gael, made strong gains. But the smaller parties - Labour, the Greens, Sinn Fein and the Progressive Democrats, or PDs - were squeezed. Independents also suffered. Sinn Fein had gone into the election with high hopes, seemingly riding the crest of a wave after joining the power-sharing government in Northern Ireland. But afterwards its president, Gerry Adams, talked of his party "dusting itself down" and looking at why it failed to build on past successes. For all its satisfaction, Fianna Fail does not have an overall majority in the 166-member parliament. For the past ten years, the right-of-centre PDs have been its coalition partners. But their support drained away this time round, and its leader, the controversial Justice Minister Michael McDowell, was the election's most high-profile casualty. So the most likely options are that Mr Ahern forms a coalition with the Labour Party or the Greens. Either way, it means a possible change of political direction. 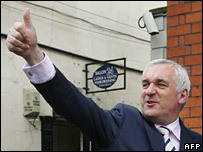 Mr Ahern is 55, and has said he will leave active politics when he turns 60. In his retirement, when he has more time for gardening and football-watching, he may look back at May 2007 with a great deal of fondness.